Pointwise, Inc. sponsored five teams for the SAE Collegiate Design Series 2012, including teams in the Formula SAE®, Formula HybridTM and SAE Aero Design® East and West competitions. The SAE series, intended to provide undergraduate and graduate engineering students with a real-life engineering challenge, has been designed to provide exposure to the kinds of situations common in the professional environment. Primarily a design competition, students perform trade studies and make compromises to arrive at a design solution that will optimally meet the mission requirements while conforming to the configuration limitations. Teams drive their vehicles or fly their planes as part of the event to give the competition grounding in the real world. The Bigg Bird team from Ohio Northern University in Ada, OH, entered in the Aero Design East competition. Highlights from some of the teams are listed below. This is the second year the UTA Formula SAE team has used Pointwise in their design process. 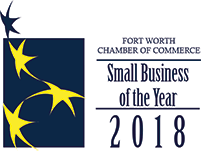 They were able to use Pointwise for both 2D and 3D analysis and to couple it with optimization software through the Glyph scripting language. This year's team began by analyzing the previous year's design to determine the area with the best opportunity for improvement. They decided the wings were the place they could gain the biggest improvements through increased downforce. 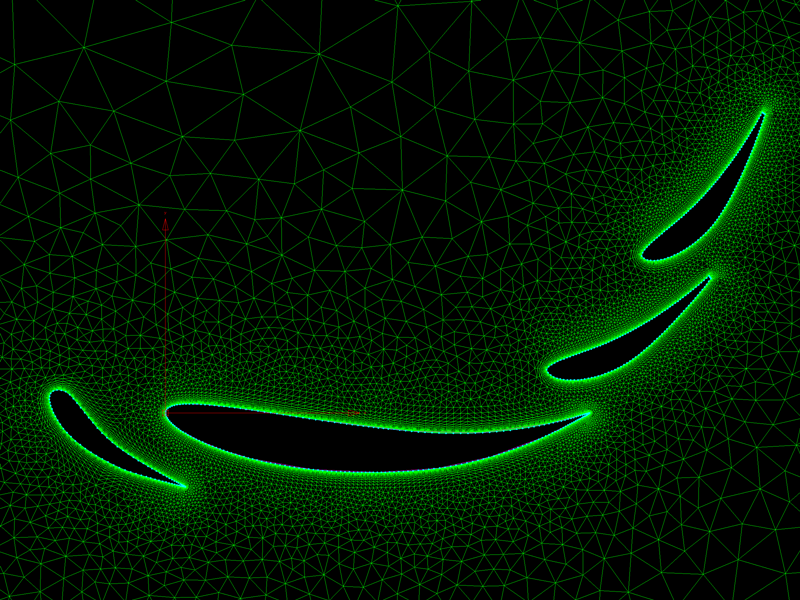 Wing optimization proceeded in two steps: an exhaustive search for optimal airfoil profile shapes, and then use of a genetic design optimization algorithm to set the relative positions of the wings. 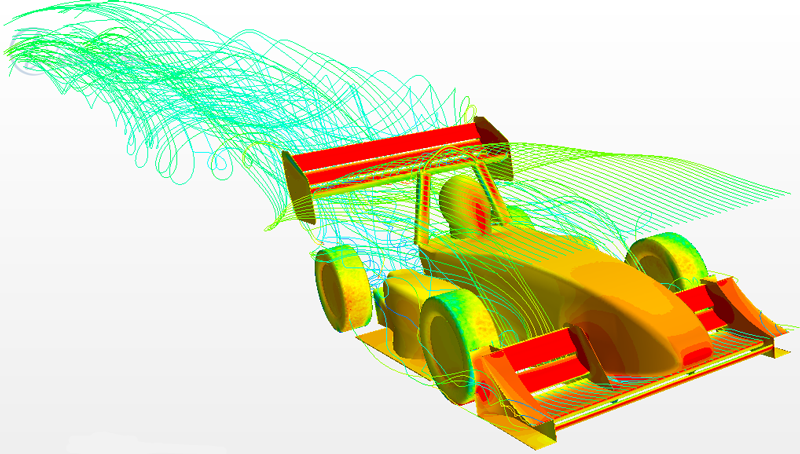 Using Pointwise's T-Rex technology and Glyph scripting, the team was able to quickly analyze a large database of airfoil profiles as shown in Figure 1, which resulted in a 30 percent increase in downforce. Figure 1: An anisotropic extruded triangular (T-Rex) mesh on typical airfoil profiles. In the second stage of the process, the team used differential evolution and automated meshing driven by a Glyph script to iteratively find the best configuration of wing positions. This resulted in an additional 21 percent increase in downforce for a combined improvement of 57 percent relative to the previous design. With the wing elements determined, the study was taken to three dimensions to design endplates and analyze the interaction between the different aerodynamic components. The endplates were designed to follow isobars, which kept wingtip losses to only a 5 percent reduction in downforce. 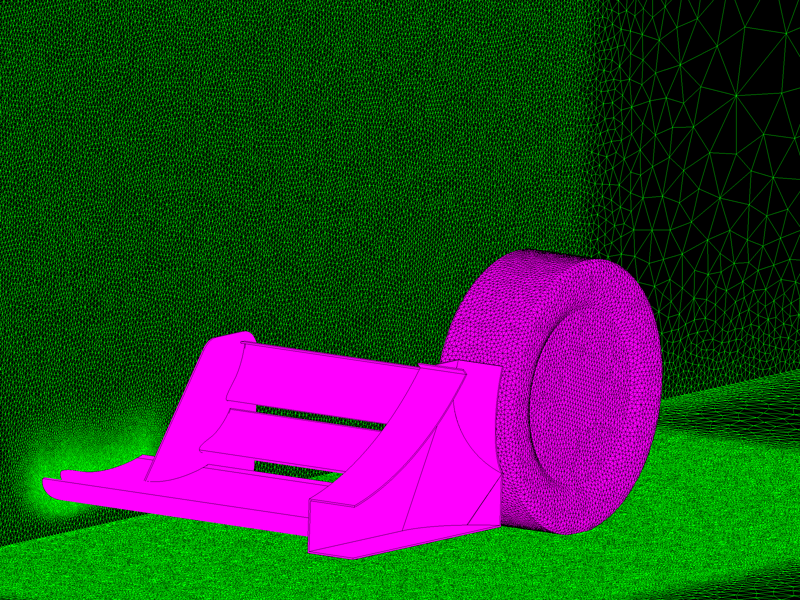 Figure 2: Pointwise T-Rex mesh on quarter car model. Figure 3: Pressure contours on quarter car model. For the front wing, a quarter car model was created to understand the interaction between the wing and the tire as shown in Figures 2 and 3. With this new information, they created a 3D endplate that increased downforce another 11 percent while maintaining identical drag. With all components finalized, a computational fluid dynamics (CFD) model of the full car (Figure 4) was created in order to fully understand the effects each component has on the others. As a result, they discovered that the front wing starved the undertray. But by adding strakes under the front wing, they were able to get back most of the lost downforce. Future work in the full car model will take place to allow them to take better advantage of these interactions. Figure 4: Flow visualization over complete car. The Bigg Bird team from Ohio Northern University and the Flying Dutchmen team from Union College used Pointwise to help analyze their SAE Aero Design competition aircraft, and both teams were able to quickly become proficient with Pointwise and use it for a number of design iterations. 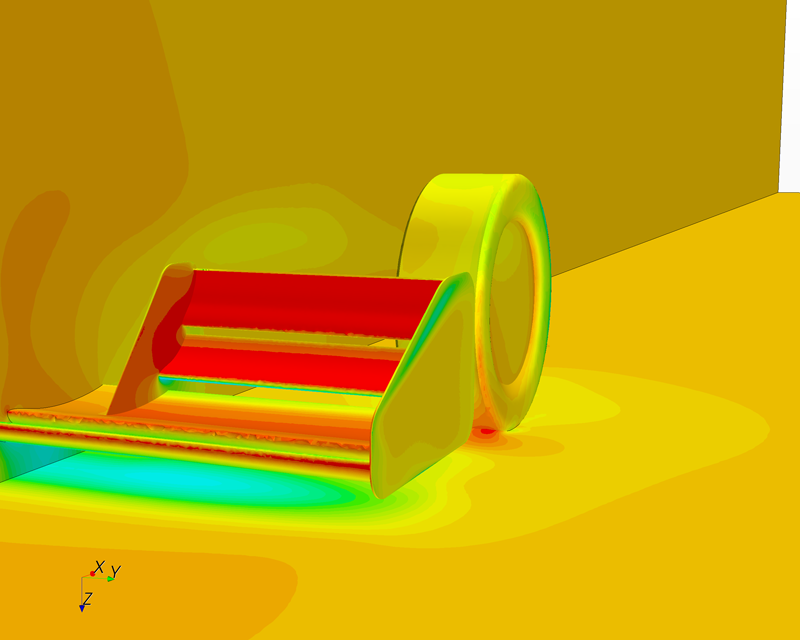 Students in the senior capstone design course at Ohio Northern University, conducted by Dr. Jed Marquart, were among the first users of Pointwise when it was released in 2007, so it is natural they use it for their SAE Aero Design work, as well. Pointwise's ease-of-use, intuitive operation, ability to quickly make complex grids, and accompanying tutorials made it easy for students to learn and start using it for their designs. 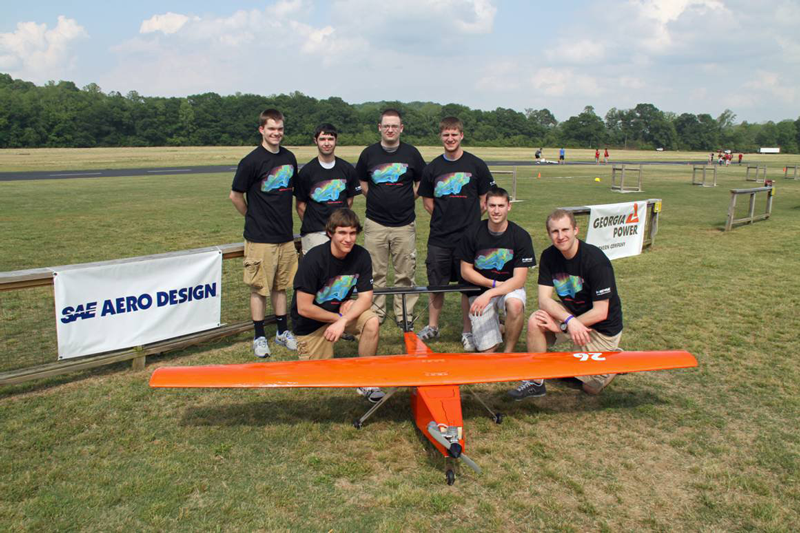 The ONU Bigg Bird team is shown with their design in Figure 5. The Flying Dutchmen used Pointwise to determine a wing planform that balances aerodynamic efficiency with ease of manufacturing. They used SolidWorks to create CAD models of various designs, then used Pointwise to create highly-refined, unstructured meshes that were used for CFD analysis in STAR-CCM+. The picture of the team in Figure 6 also clearly shows the wing planform they settled on. Figure 5: ONU Bigg Bird with their airplane at SAE Aero Design East 2012. 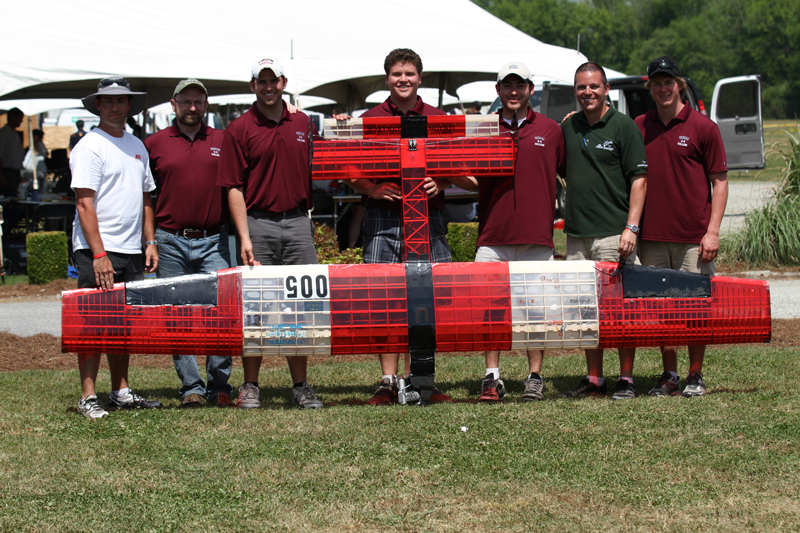 Figure 6: The Flying Dutchmen team from Union College. In addition to striving to be the world leaders in CFD meshing, Pointwise tries to be a good member of the engineering community. Sponsoring students participating in the SAE Collegiate Design Series is one way to do that. Pointwise also works closely with students through its Pointwise Teaching Partnership program that provides free licenses to academic institutions for use in a classroom setting. For more information on the teaching partnership, visit www.pointwise.com/teaching.